What a good question! And it’s the first one I received via my new website from a fan, so I wanted to include my response here. If you have a question that you’re dying to ask me too, please write to me – I promise to respond, and I might include your question here too! I have two early memories of being influenced to write when I was young. 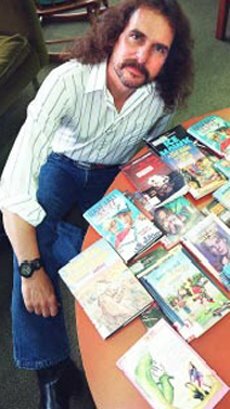 I remember getting to attend a writers workshop for young people when I was in maybe grade 5, led by the late, great Canadian writer, Martyn Godfrey. I was obsessed with his Ms. Teeny Wonderful series, and also a book called Do You Want Fries With That? How thrilled I was to be in the same room as him. I remember being conscious of the fact that he was a writer, and for the first time, I realized there was something inside of me that made me a writer, too. I didn’t know this at the time, but he was a kind teacher and tireless proponent of reading and writing for children. After his death in 2000, the Young Alberta Book Society created the Martyn Godfrey Young Writers Award. If you are an Albertan writer and you are in grade 4-9, you can apply for this award every March. My grade 8 teacher in Junior High inspired me to be a writer, too. Her name was Sylvia Hayward. She loved books and helped the teenaged me be confident in what I was putting on the page in English class. She helped me publish something I wrote for the first time, and somehow got CBC to come to the school to record me reading it into a tape recorder in the teacher’s lounge. My heart was pounding in my throat that day, partly because of the official looking CBC tape recorder I was speaking into, and partly because I was in the teacher’s lounge for the first time. It was weirdly quiet in there, and the couch and chairs were covered in brown velour and smelled like cigarette smoke. Ms. Hayward also let us paint the gym walls blue for our grade 9 graduation ceremony, and came to the first book launch I ever did in Calgary when I was all grown up. She is one great lady and I’m so grateful for the push she gave me down this path. I didn’t start writing seriously until I was older, but without her I don’t know if I ever would have started. Thanks Ms. Hayward! How about you – who inspires you to write? Can you think of anyone who helped you get started? I would love to hear your story – just leave a comment below! I know one person who inspires me to write is you! I love the work that you do and think you have such amazing ideas. You have a magic touch with the written art and inspire me to write better and more and I hope that I’ll someday publish a book (or more….) just like you! I love you dad! Thanks Emma! You are an inspiration to me too! It’s great to have another awesome writer in the house to brainstorm ideas with! Love you!